RENOVO SOLUTIONS provides research, life science and healthcare technology management solutions to help reduce costs, increase quality and improve medical equipment performance in life science, academic and research facilities nationwide. We also provide unbiased and objective technology management advice and consulting. RENOVO SOLUTIONS was formed by the Leadership team, innovators in their field with over 100 years of combined experience in the healthcare and clinical industry. Drawing from those decades of service and experience, RENOVO, which is Latin for “renew”, aims to reinvent and simplify the concept of medical equipment management. Therefore, we provide flexible, customized and comprehensive solutions that address the complexities you face within your facility. Escalating service costs, decentralized service management and difficulty keeping up with preventative maintenance or repairs are just some of the challenges RENOVO can help your facility overcome. When you engage RENOVO SOLUTIONS, you’ll find we are the single source solution – whether that means a comprehensive equipment program and strategy or finding the right balance of involvement of RENOVO along side your team. 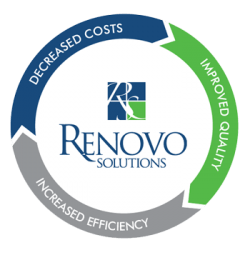 RENOVO SOLUTIONS’ goal is to bridge the gap between reducing costs while improving quality and equipment performance. We believe the solutions we offer should be as unique as your facility and made flexible to meet your facility’s individual needs. We believe in transparency in how we interact with our customers. We believe that you should be treated as a respected partner as we work together toward finding your solution and achieving your goals. And we believe that when you trust us to work for you, you will see an improvement in your facility’s staff and patient experience. At RENOVO SOLUTIONS, promises made are promises kept.